Dolls houses for children Le Toy van, & Chalet style wooden dolls house by plan toys. The dolls house prices include all furniture. The top selling houses are, My First Dreamhouse Lavender dollhouse, Baytree doll house, Chalet and Victorian house. These make delightful Birthday or Christmas presents, providing hours of entertainment. And should you choose anything as a Christening gift, you will find they will make a perfect heirloom for young children. Dolls Houses from 1600 A.D. to 1900 A.D.
As mentioned, the wooden dolls houses for children all come with furniture and dolls as shown in the pictures. We have access to a large selection of unique toys and traditional toys for young children. 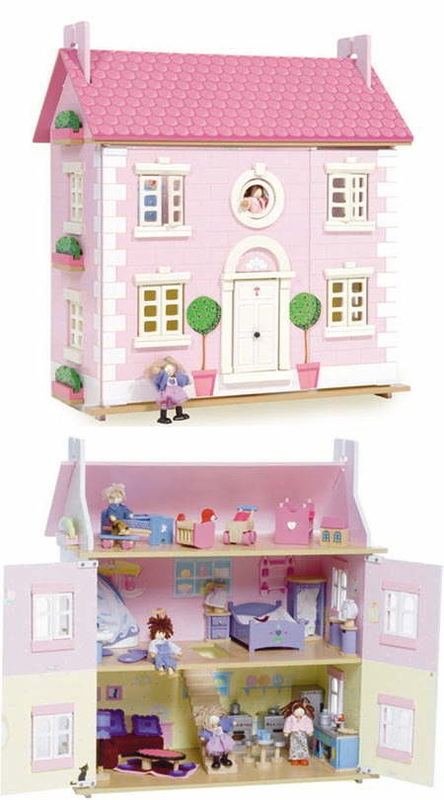 The wooden kids dolls houses are unique and some are particualarly exclusive. Our range includes hand painted and also plain wood dolls houses, a delight for every little girl. We are confident you will not easily find this huge selection of traditional dolls houses online anywhere else. Make this a special Birthday or Christmas gift for your little girl. I was referred by my brother. The company have a unique product that is a Personalised Stool. You can have a fantastic and educational children's toy made based on the letters of your kid's name. I ordered this from the website, as well as a dolls house, which I noticed was £20 cheaper than a couple of other toy sites. My experience at other e-commerce sites has generally not been good, with lousy shopping carts, an insistency that you provide all kinds of unnecessary data to make your data (why do they ask for your fax number? I have never once had a fax from a website in nine years), encourage you to sign-up to their and their partner's mailing lists (yeah, spam me for ever baby with your offers), but here it was plain sailing. I made my purchase in five minutes.